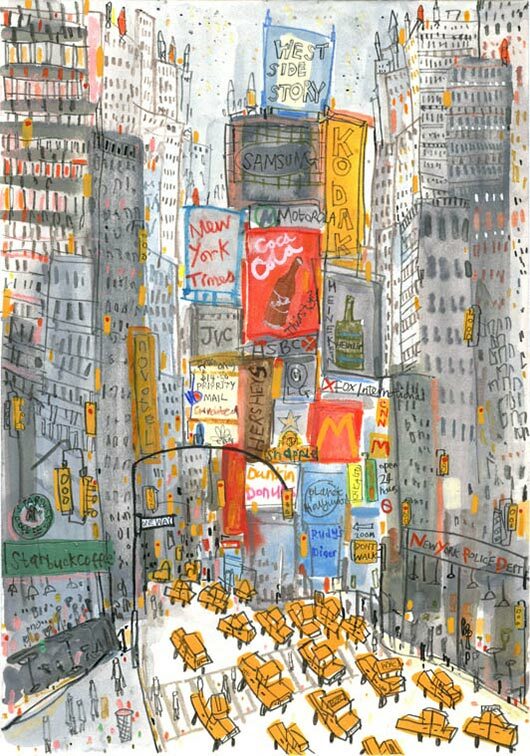 All images copyright Clare Caulfield, and reproduced here with permission. Please contact Clare Caulfield, the copyright owner, if you have any queries. 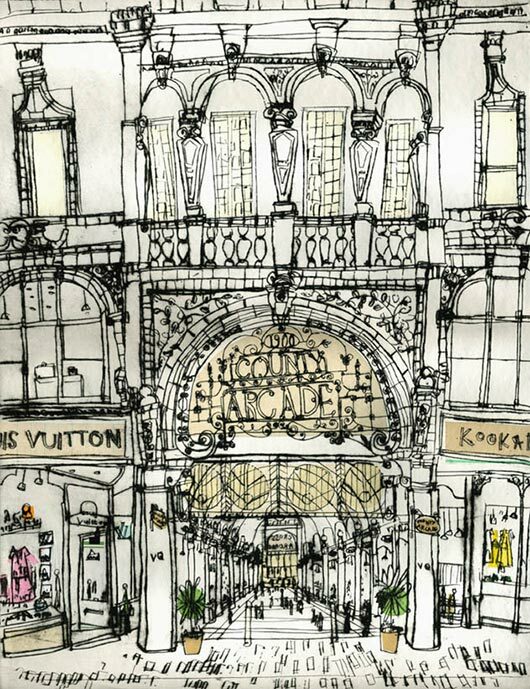 I am a Saltaire based artist and printmaker whose work is inspired by my travels to some of the world’s greatest cities including Paris, Venice, New York, Rome, Istanbul, Reykjavik, Prague and San Francisco. I love travelling to new places and I use the energy and buzz of these beautiful cities to create my lively and evocative paintings. 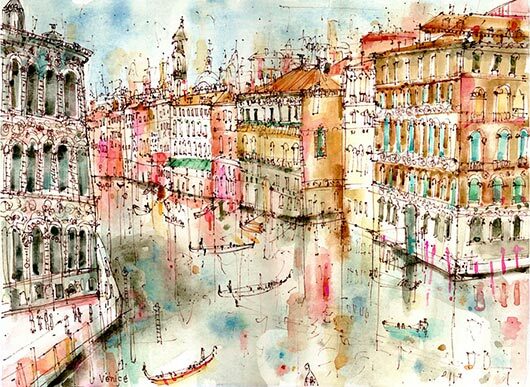 Drawing has always been an important part of my work, I’m fascinated by architecture be it the jumble of apartments, storefronts and skyscrapers in Manhattan or the elegant splendor of Venice and it’s canals, or simply capturing Parisian life outside a brightly canopied pavement café. I only paint the places I have visited, producing sketchbooks filled with drawings and ideas on location. I love working in a variety of media: watercolour, acrylic and collage. 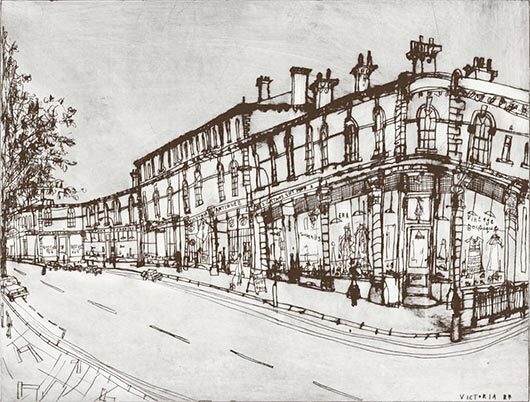 Drawing and linework feature heavily in my work, I use graphite pencils, dip pen & ink, pencils, pastel and I wouldn’t be without my brown sketching pens which enable me to make quick reference sketches that I’ll work up in my studio when I get home. I also take lots of photographs and pick up all sorts of odds and ends from menu’s to postcards and local newspapers, anything that will help to conjure a memory or spark my imagination. Using my preparatory sketches and drawings I try to work as spontaneously as possible in order to achieve lively and energetic line work. When starting a new painting I don’t sketch it out on the paper first, instead I begin by putting down watercolour shapes to suggest the forms of my subject. Then I work into these with line and build it up from there. I produce my handmade original prints at West Yorkshire Print Workshop where I also teach weekend screen-print courses. Screen-printing allows me to transfer the lively drawings taken directly from my sketchbook onto both paper and canvas, within many of my screen prints I’ll combine elements of hand painted acrylic and watercolour to create prints that are individual pieces in their own right. I also make drypoint prints as I love the rich velvety line quality it creates. 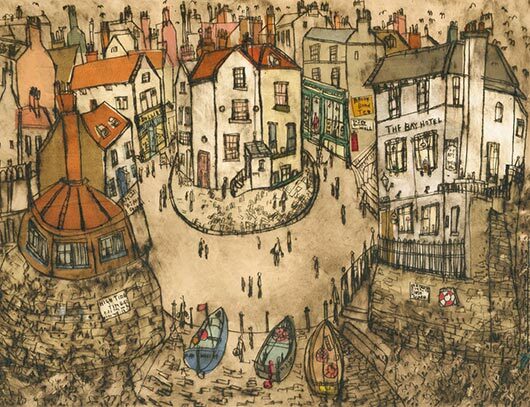 For my ‘Whitby’ drypoint series I combined this technique with ‘chine-colle’, a time-consuming process in which I cut up hand-painted sheets of paper into various shapes and sizes in order to create a patchwork of rooftops and chimney pots. The plate is then run through an etching press to make each print one at a time. 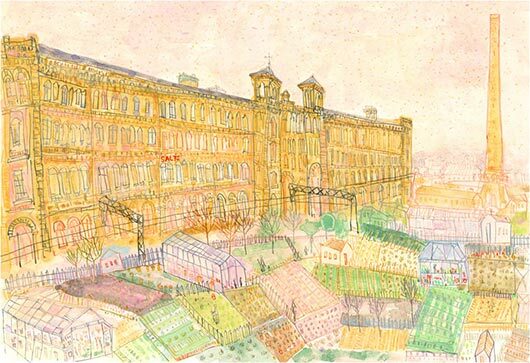 I live and work here in the lovely World Heritage village of Saltaire. 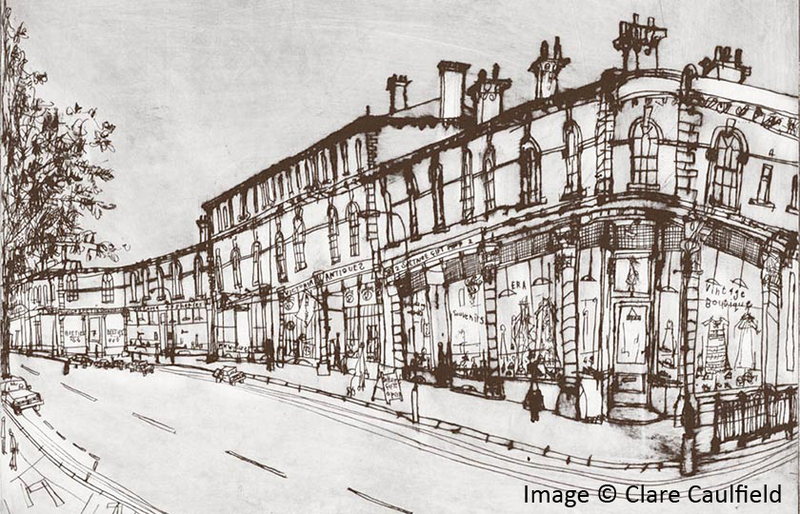 My surroundings are a big inspiration within my work: Salts Mill, Albert Terrace and the shop fronts of Victoria Road, all of which I’ve drawn over the years. 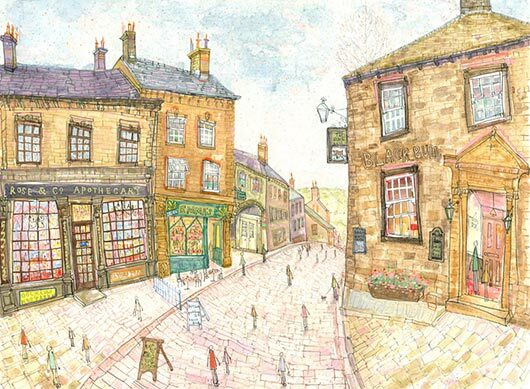 My collection also includes other Yorkshire images of Leeds, Haworth, York and Hebden Bridge. Please visit my website www.clarecaulfield.co.uk to view more of my work.